Think your iPhone or BlackBerry is the wave of the future? Feh! Behold the marvelous technology of 1913, represented by E.C. Hanson's "automobile wireless telephone". 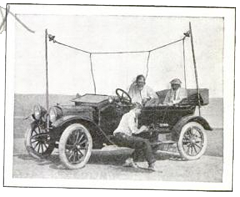 With his buggy outfitted with two telephone poles and various high-voltage insulators, Hanson could make calls from the road up to 35 miles away. Technologizer has a fun lil' read up on their site about Hanson's "cell phone" and fourteen other innovations that were decades ahead of the curve. Like Thomas Edison's idea to print a 40,000 page book that would be only two inches thick, using ultra-thin metal plates instead of paper.